If club members have kittens available for adoption they will be listed in our 'classified' section below. No other kitten register list is kept by the club. If none are listed, please check back again or contact a breeder on our web page listing. Birman kittens are generally available from Spring to early Autumn and the girls have a well earned rest during winter. This is normal for all Longhaired breeds. Please note: Only Birman Cat Club members are listed in the kitten classified section. They are obligated to abide by the Code of Ethics they agreed to on becoming a member. 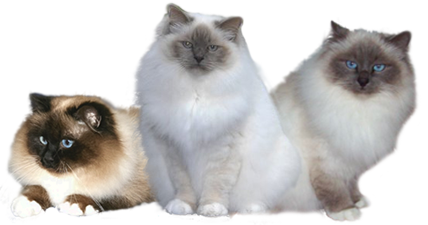 The Birman Cat Club of Australasia Inc. is not responsible for any purchase the public may make via this service. However, if you are not happy, we would like to know.